Can Art Classes for Kids Really Benefit Your Child? The research has been in for some time. It has been determined that the kind of art education that can occur during art classes for kids can lay the groundwork for future career or academic success. Creative children have a more well-rounded view of the world, they are not afraid to be expressive, and their self-esteem is strengthened through their artistic endeavors. Valuable learning does not solely happen with the left brain – the side of the brain that steers us towards accuracy, and rational thinking. Additionally, artistic learning or right-brained learning should not be pigeon-holed into being seen as largely unnecessary or optional in that it does not provide real benefit for us from childhood into adulthood. Learning or developing skills in art or poetry is not simply beneficial because your child will learn a novel skill. 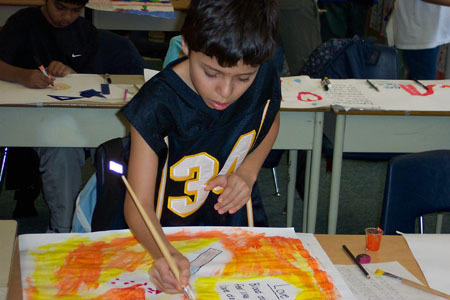 Art classes for kids balance your child’s learning and helps to build their thinking skills. People are often captured by art or poetry on an aesthetic level. They comment that art or poetry captures or exudes beauty. They remark on how enriched that they feel as a result of these artistic creations. But what about the creators of such beauty? During art classes for kids, the creators of this beauty are not just enriching others but they are enriching themselves through the very process of creating. These young creators are creating pathways for how they will experience and understand the world. The unseen benefits lie in the process of creating during art classes for kids. Instructors who teach art classes for kids use the lessons as a way to expand a child’s cognitive skills and give children a way to stretch their thinking in order to solve problems. The creation of both art and poetry can push children to solve old problems in new ways – an extremely valuable skill to master. 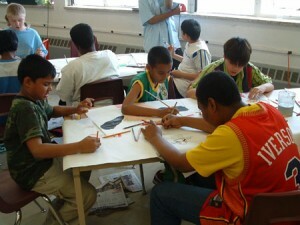 Another part of the process that is beneficial during art classes for kids is the reflection process. After a child has been enriched through the creation process they can begin to open up their minds to self discovery as they reflect on their artistic or poetic creations. It is during this process that a child will learn a lot about themselves and discover new ways of seeing the world and experience life-affirming behaviours. We teach our children from a very early age to value learning. Of course the information that one learns is valuable but the process for learning is also extremely relevant for a child’s mental and emotional growth. 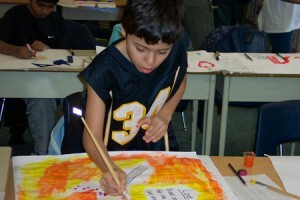 Art classes for kids focus on both. These classes focus on developing creativity works of art and poetry that a child can be proud of while reaffirming their ability to create beauty with their own hands and imaginations. Quality education is not simply found in the subjects that focus on logical reasoning but it also comes to life by finding ways to encourage creative and alternative thinking. Register your child for an art class at Poetic Art Studio today. The Studio’s focus on each child’s learning and creative process will give your child a unique and memorable experience.